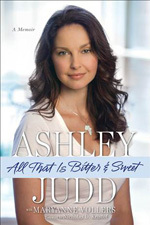 It's noon on the West Coast, and Ashley Judd is scurrying to make a live on-air interview with a National Public Radio local affiliate in Berkeley. Her voice sounds surprisingly energetic despite her frenetic schedule of late -- seven cities in nine days -- to promote her recently released memoir, All That Is Bitter and Sweet. The book is the first lengthy writing venture for the 43-year-old Judd, an actress best known for her roles in films such as Someone Like You and Where the Heart Is. But lest you dismiss this as yet another celebrity vanity project, consider the subject: A chronicle of her shift in focus from movies to what she calls her "true calling," feminist social justice activism, the memoir details her on-the-ground experiences in the slums, brothels, and hospices of 13 countries. Confessions of an Heiress this ain't. Part Anne Lamott, part United Nations briefing paper, the book also recounts Judd's faith journey or, as she describes it, her path to standing "autonomously with the God of my understanding." After being released in early April to critical acclaim, All That Is Bitter and Sweet quickly vaulted to number five on the New York Times bestseller list for hardcover nonfiction. "Stunned," she tweeted when she learned the news, a word that could also describe the reaction of Judd's many fans and some in the media when she largely abandoned her successful film career in the mid-2000s to devote much of her time to social activism. The book promises to put her new life in better perspective. "It's [been] a way for me to memorialize the sacred narratives from around the world with which I've been trusted," Judd told Sojourners of chronicling her global experiences on the page, "to celebrate the grassroots programs I work with, as well as to process my own feelings and to continue to engage with my Creator." ... continue reading this article at Sojourners magazine. Jason Howard is the co-author of Something's Rising: Appalachians Fighting Mountaintop Removal. His features, essays, and reviews have appeared in The Nation, Equal Justice Magazine, No Depression, Paste, and The Louisville Review, and his commentary has been featured on NPR. This article originally appeared in the July 2011 issue of Sojourners.